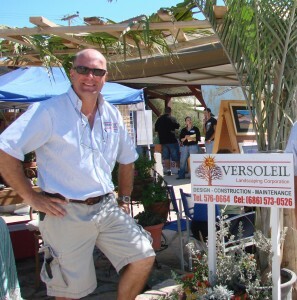 The San Felipe landscaping company Versoleil Landscaping, was selected to landscape the new Rosarito Beach Convention Center of Baja California. It was a massive job that included planting 185 palm trees, all over 30 feet toll and planting 34,000 (thirty four thousand) ground cover and small shrubs. Versoleil Landscaping finished the job in on 5 weeks. William came to San Felipe nearly a decade ago with the French company Gregori International to construct the 18-hole Las Caras de Mexico Golf Course within the Beach and Golf Resort of La Ventana del Mar. Start to beautify your life and yard today. Let us show you how we can turn your desert home into a desert paradise. We offer over 25 years of landscaping experience.